Houston Mod invites you to join us this Sunday, June 26, 2016 for a Mod of the Month open house event from 2 - 4 PM. This month's event takes place in the Memorial area of west Houston, located about 11 miles west of downtown. 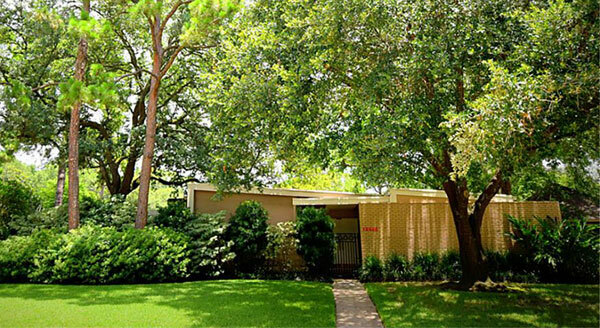 Let's help find a new preservation-minded owner for this vintage modern house. Thanks to Houston MODern Market for sponsoring this FREE event. Save the date for the next MODern Market on April 21-23, 2017! 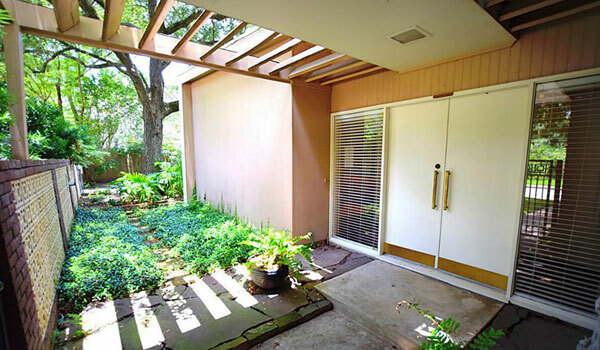 A double door court yard entry sets the tone for this early 1960s contemporary home situated in a beautiful wooded Memorial area neighborhood. Other much desired modern aspects such as walls of plate glass, a special low slope roof, double carport, solar brick screen wall, and a louvered canopy complete the mod scene. The area has sought after schools as well as a number of architect designed houses. Houston: Uncommon Modern Wins National Award! The Houston: Uncommon Modern project has won a Modernism in America Award! The annual award program by Docomomo US has announced 10 exemplary projects to be honored this year from across the country that raise awareness of the importance of architecture, landscapes and typologies of postwar society in the United States. The co-curators, Anna Mod (Houston Mod co-founder) and Delaney Harris-Finch (Houston Mod board member), will receive the Survey/Inventory Citation of Merit award at a ceremony on September 22, 2016 in New York City. Houston Mod is pleased to be associated with the Modernism in America Awards program for the third year in a row! Last year, Save The Dome (a coalition of Preservation Houston, National Trust for Historic Preservation, AIA Houston, Houston Arts & Media and Houston Mod) received the Advocacy Award of Excellence for the public education effort to save the Astrodome. Two years ago, the inaugural presentation of the Modernism in America Awards program was hosted in Houston at the Docomomo US National Symposium in the sanctuary of the downtown First Church of Christ, Scientist. There are plans underway for the Houston: Uncommon Modern exhibit to be displayed elsewhere in Texas in the near future - details to follow. The exhibit catalog will be available at this Sunday's Mod of the Month event along with other Houston Mod publications. Do you shop on Amazon.com? Donate a small percentage of your purchases at no cost to you by adding Houston Mod as your charitable organization of choice at Amazon Smile. Join the Houston Mod Facebook Page and Houston Mod Discussion Forum for more mod-minded fun. Support future Houston Mod events by becoming a member. Houston Mod is dedicated to promoting knowledge and appreciation of modern architecture and design in Houston and Texas and advocates the preservation of this cultural legacy, seeking support from its members and the general public in achieving this goal.